Someone called me today and explained this to me. They saw the discussion here but wasn't a member so didn't think they could post. I wish I had remembered to tell him that he could post in an open discussion without signing up as a member and asked him to come back and post his explaination here. 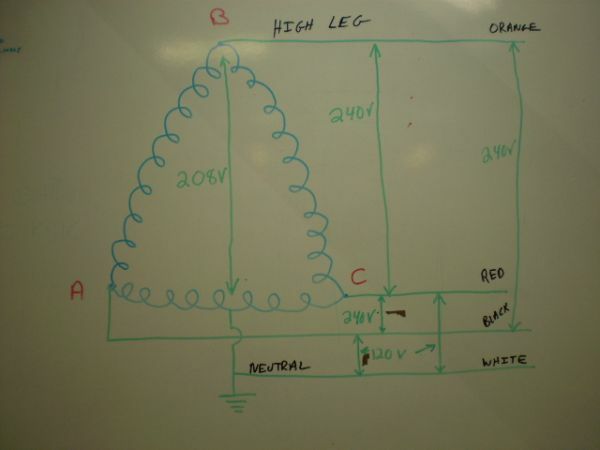 The jest of what I got and can remember, he said some industrial applications are wired with a wye-delta transformer, (I could be very wrong on that being what he called it), but he said you have 3 legs, A/B/C, A-B/B-C/A-C will all be 240 volts, A-Neutral/C-Neutral will both be 120volts and B-Neutral will be 208volts, (he said they call this the stinger leg and in some applications they wire all lighting up to this leg to balance out the load. He also said you have to do just as I did when wiring up the oven, know that you're dealing with this type of system and make sure if something in your application requires the the 120volt leg that it's wired to the A or C leg NOT B.
I guess the way the circuit box is configured any where in the box when you install a 2pole breaker you will be getting the A-B legs or B-C legs, the only way to get just the A-C legs is with a 3 pole breaker and not use the B leg tap, wasting a circuit spot in your breaker box, (he said in his explanation). OK, starts soundin plausible. for those who aren't yet familiar with the issue, here's an awfully sloppy drawing to visualize the components of a 3 phase stepdown transformer. The T1-T3 wires are for the transfer network. the respective primary windings are the red, green and blue boxes drawn over the left side of the black contraption, which is the transformer core. These are wired in triangle, or "delta" as we already have, and in the future, will call the connection. On the right side of the core there are six windings, or three pairs, labelled A to F. This layout is very versatile, explanation coming up. Each pair with consecutive alphabet and matching color would be capable of working as either a split-phase pair, serving one home with the very common 2x120V/1x240V feed... or, as two individual 120V feeds if such service is ordered. Remember we have three such pairs in this example, we could wire three homes with split phase, two homes with 3-phase, or 6 homes with single phase if we wanted to. So, joining the windings A+B, C+D or E+F by the center wires, and wiring these as a Neutral wire, would allow us to tap the free ends of each pair for three 2x120V split phase feeds. Bridging the A, C, and E windings by the center wires, then B, D, and F windings the same way, would give us two 3x120/208 feeds. Bridging the same pairs without grounding the center taps, but rather joining the free wires of A, C, and E and grounding that wire, then running the free wires of B, D, and F as L1-L3 to the home, would give us a 3x240V, 3 phase feed... very similar to the service that Finnish owners of single home buildings usually subscribe to. And now, for the tricky part, and more vector graphs... Lo and Behold Below! So, here's what I found to be a plausible solution to our dilemma. If the previously described transformer was wired by bridging all the center wires of the windings together, we would have a voltage vector layout like in the upper left corner of this, another really poor drawing. If we bridge the A and B windings together by the center wires, then make this point the Neutral point... and then we bridge the E and C windings together WITHOUT GROUNDING THAT POINT.... and further, bridge the free wire of the E winding to the neutral point... TA-DA! .... We have a 2x120V split phase feed. .... AND WE HAVE 240V FROM THAT POINT to each live leg of the split phase feed. Further we could wire the D and F windings the same way, and tap them to the other side of the graph... we would now have a 416V feed too! Now that I have thought up a plausible solution to this... I still don't understand why anyone would want to wire lighting to the 208V leg... they would still need to have lighting devices designed for 208V. After thinking about it, that was the thing that kind of threw me off also????? bright lights for the time they worked, but for how long. always on the lights maybe able to handle it and also ?balance the sysem load at the same time? After sleeping the night and letting the old beer odor and crapulent feeling pass, I re-thought this even further. The person who called you, said that it was an industrial setting. They might well have high power lighting fixtures that are designed for 208 or 240V hookup. Otherwise, wiring standard 120V lights to 208V would triple their power and burn them out in seconds. With constant load resistance, when voltage is multiplied by SQR(3), current is multiplied too. Power being the product of the two, it will be multiplied by SQR(3)^2 (which equals 3). It wouldn't be really sensible to try and load the 208V feed so that it would "eat off" the excess... would take a lot of current, and the system would be unstable... one bulb pops open, the others get brighter, and they start popping open at an exponential rate... no, it's probably 208V stuff. But yes, this wiring will give all of that. Actually it doesn't even need more than one secondary winding on each pole on the transformer core... it only takes these three 120V feeds that are offseted by 120 degrees each... wiring all of them serially (accounting for polarity of course) and tapping one joint for Neutral, will give you just this. The hospital I worked at some 10 years ago, had their kitchen remodeled a bit, got two large cooking vessels that replaced the old steam operated units... each had a 3x230V, 63A feed wired for them... the cable used for that was thicker than my wrist. Whew, the kettles alone were allocated more power than five single home buildings, and there were already two recently installed baking ovens and ancient but functional cooktops of the same scale. But then, that kitchen catered for the whole hospital, the home for the elderly, and two schools that I knew about. EDIT: Just noticed that I'm constantly getting more and more typos like leaving characters out, swapping their positions, or striking the wrong keys altogether... this is probably my hardware getting old and cranky... let's hope that the snotware development team figures out a workaround. And, hopefully they will get the Virtual TAAMI module re-worked to be less unstable. Just waiting to see and feel what they have screwed up with Doors OS kernel 32.00 build 1 (due on May 21). Im the one who called Willie. I need to start by retracting a couple of statements. First, The part about the lighting on the HIGH LEG may or may not be accurate. I remember hearing this from someone or maybe it came to me in A dream. I thought I had evidence to support this but came up with nothing. For now we will erase this from our minds. Second, after visualizing it in my mind it is also possible to pick just C-A with A two pole breaker. These are really mice nuts in the scheme of things. I just wanted to clear this up before I have everyone in the electrical world come down on me with vengeance. The important thing here is to realize that delta high leg configurations are out there. Well, is it anything like the diagrams I came up with? This is the only one I have. But note A in this case is the high leg. I guess it is quite the same. Looking at my latest drawing, the LB leg wouldn't be necessary, the transfromer would do with three secondary windings (one on each pole of the core) then a serial wiring, and tapping one joint for Neutral, would give such a setup, where you would have one leg with 120V to Neutral, one with 208V to Neutral, and 240V between the two live legs. This would differ from standard 208 and 240V layouts, but not remarkably considering most applications, as long as the person who wires the thing up knows what they are doing. A dryer or oven element, or a completely 240V cooktop or other similar device that doesn't use the Neutral connection, would not care if the 240V it gets is 60, 120 or 180 degrees off the phase of the 120V feed. Anyway, such wiring would be very unusual back here, I haven't run to one that even resembles it a wee bit. Surely one who hasn't seen it before, would be stumped for a good while. Why not. I see that you're wiring the secondary windings in a triangle fashion? I imagine that would require them to be 240V windings, and one of them to be center tapped for Neutral... I must think about this option. Sorry, I didn't call you back, I ment to call you today but got busy and didn't get home till 9pm tonight. I was looking for the way to let you post with having to pay for the membership. Sorry, no way to do that now I guess. It is not A problem. I was going to pay for the membership anyway. This just sped the process up A little. It seems that you had there 240V 3-phase Delta service with High Leg. It means that at the transformer three secondary coils are connected in delta, like a triangle, with L1 and L3 at the bottom and L2 (high leg) at the top (of course, that's the grapgic representation only). In the middle of the L1L3 coil neutral wire is connected. 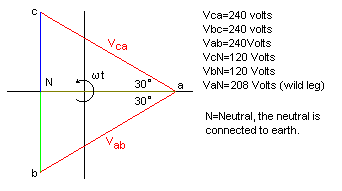 In all cases L-L voltage will be 240v and L1-neutral and L2-neutral will be a half of it i.e. 120 v, since it is tapped in the middle of the coil. Voltage between L2 and neutral will be about 208v. It seems that these figures are quite close to those that you've measured, being slightly lower due to extensive network and voltage drop. So technically the transformer layout I posted a few messages ago could be wired to produce either Electrician Dude's Delta connection, or two of my Wye connections, or up to 416V output with neutral in the center. Versatile, huh? What you've posted is a standard transformer with delta primary configuration and depending on secondary winding connectin it may be D/Y or D/D. Produced voltage depends on primary voltage and number of winding turns on primary and secondary side. Budget did you ever get your question answered on this one. Three phase 208 is 120 phase to ground. It sounds like you have a high leg delta. It should have a orange colored. Do a google on high leg or wild leg 240 phase connection. It is also in the NEC code. Yes, it was discussed all in this here topic and was found to be exactly what you are saying. Glad to hear it. it was late and I was too lazy to read the whole thread. I have seen some on this subject before and they tend to get quite long. Mike Holt NEC code forums and news letters are an excelent source. Delta systems can give funky terminal to ground voltages. And connecting neutrals from different supplies can get you in deep shoo shoo.